What is another word for competitive? Pertaining to or characterized by competition. cost-competitive, uncompetitive, pro-competitive, anti-competitive, non-competitive, pro-competition. 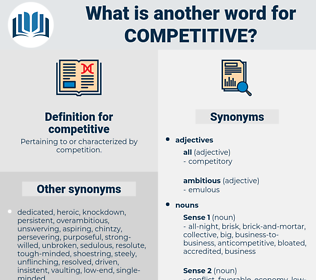 competition-related, in-competition, cost-effective, antagonistic, high-calibre, conflicting, aggressive, commercial, profitable, fierce, efficient. jobs, Sports, Advertisements, Opportunities, powers, Resources, offerings, awards, proposals, states, compete. competitiveness, competent, attractive, competing, concurring, competitor, competitors. competitiveness, competition, competitions, competing, competitor, competitors. cooperative, accommodative, monopolistic, unaggressive, socialist, nonaggressive, socialistic. It pays to advertise in the newspapers and secure as many competitive bids as possible for the timber on the stump. Capable both of virtuous resolutions and of fits of apathetic obstinacy, His Majesty is usually the whip - top of competitive advisers; and his conduct is so unstable as to wear at times an appearance of treachery which would surprise himself if he could see it.